and that was exactly what he did. He first learned to play the banjo, and then did a fast run through clarinet, cornet, and alto sax. He finally settled on the slide trombone and formed the Original Creole Jazz Band. He became a successful band leader in New Orleans because he hired the best: "King" Oliver (later replaced by Louis Armstrong) and Sidney Bechet for starters. "Kid" the moved to California for his health and created Spike's Seven Pods of Pepper Orchestra; the first black jazz band to record. Thus, he carried the jazz movement to the West Coast. His next move was to retire to his brother's chicken ranch in Chicago, but he soon returned. 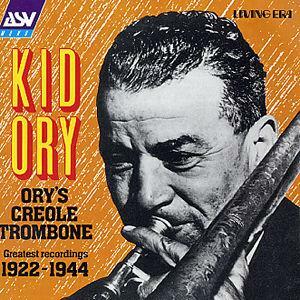 Ory always stayed busy, making records in Chicago, starting another new band in New Orleans at the time of the Dixieland revival in the 1940's, and touring Europe in the 1950's. He finally went farther west, again for his wealth, and moved all the way to Hawaii. He surprised everyone by coming back to New Orleans for the 1971 Jazz Festival. 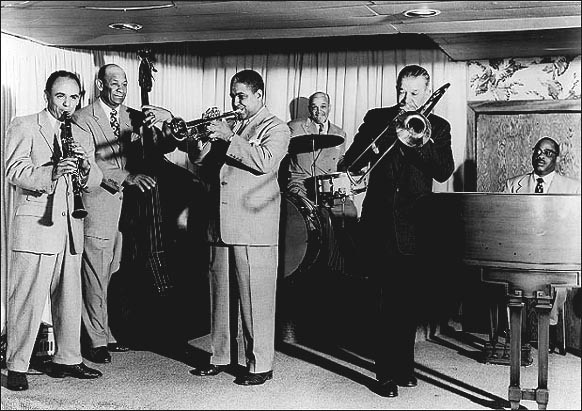 "Kid" Ory and George Brunies were said to have perfected the underpinning of a trombone to pull the lighter horns together, which helped the sound of swing as it was coming into vogue. Ory wrote the highly successful music for "Muskrat Ramble." His music was also featured on Orson Welles' radio show. He then worked steadily in Los Angeles writing music for such movies as New Orleans and The Benny Goodman Story. Some of the band's most requested pieces were "Tiger Rag" (later adopted by Louisiana State University), "Eh La Bas" (Hey down there), "Mahogany Hall Stomp," "Oh, Didn't he Didn't Ramble," and "High Society." For All The Jazz Greates..Go to...RedHotJazz.com.